FAMILY PORTRAIT: John and Aileen Crowley with Megan, John Jr., and Patrick. That was when Crowley, president and CEO of Amicus Therapeutics, first got a taste of how it would feel to be the subject of a movie. Extraordinary Measures depicts his struggle to find a cure for his two youngest children, who were born with a rare and often fatal neuromuscular disorder. Watching its production was, alternately, an unreal, thrilling, and deeply emotional experience for the Crowley family. Less than a year after delivering the Class Day address at his HBS graduation, Crowley and Aileen learned that Megan, fifteen months old, and Patrick, seven days old, had Pompe disease, which destroys muscles, degrades breathing, and dangerously enlarges the heart. They were told that Megan and Patrick wouldn’t live past their second birthdays. 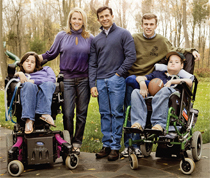 The Crowleys took to the Internet, where to their dismay they learned that because Pompe afflicts so few people — less than one in 40,000 — no treatment had yet been developed. Determined to change that, Crowley quit his job as a marketing executive for Bristol-Myers Squibb, befriended a scientist who was pursuing a promising treatment, and became CEO of the researcher’s fledgling firm, Novazyme Pharmaceuticals. But Crowley’s personal involvement in the cure he sought almost proved his undoing, as perceptions of potential conflicts of interest threatened to keep his kids out of the clinical trials that could save their lives. The movie, which opened in late January, stars Brendan Fraser as Crowley, Keri Russell as Aileen, and Harrison Ford as Dr. Robert Stonehill, a composite of the doctors who treated the Crowley children and researched a treatment. Extraordinary Measures is inspired by the book The Cure, written by Wall Street Journal reporter Geeta Anand. An early version of the story is also told in the HBS case, “A Father’s Love: Novazyme Pharmaceuticals, Inc.,” by HBS professor Richard Bohmer and Bradley Campbell (MBA ’02). Crowley gave the film “two thumbs up” after he saw the director’s cut in late October. The characters “captured the spirit of the family,” and “there was a lot of good humor” that evoked laughter from the research audience, Crowley notes. But he also saw tears in the eyes of audience members, who also clapped at the end. The message of the movie, says Crowley, is that if you deal head-on with adversity, you may eventually overcome it. He also wants viewers to understand the promise of collaborations between scientists and business — and the importance of continued innovation in medical research. Spoiler alert: Megan and Patrick, thanks to their father, are now, respectively, in seventh and sixth grades in Princeton, New Jersey, public schools, aided by ventilators and wheelchairs and accompanied by nurses. Pompe doesn’t affect their minds. “They’re bright, precocious, and very happy kids,” says Crowley.